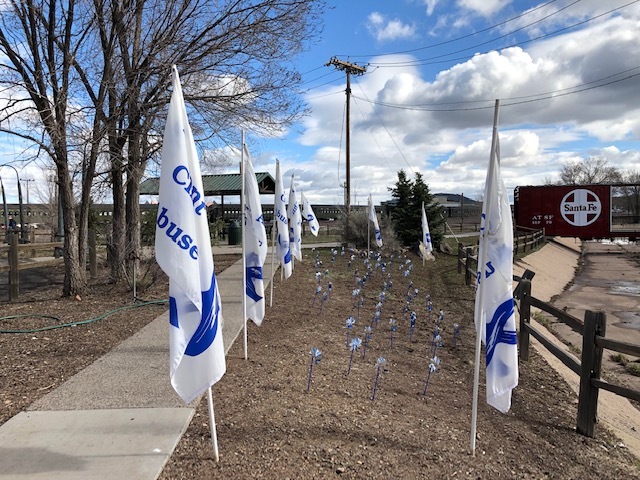 Pinwheels twirled in the breeze as guest speakers spoke of the significance of April as Child Abuse Prevention Month during a ceremony held Saturday, April 6 at the Williams Pocket Park near the city “Red Train Car” bridge. The event was hosted by CCC&Y. Guest speakers including Coconino County District 3 Supervisor Matt Ryan, District 1 Supervisor Matt Ryan, Williams Mayor John Moore, Jennifer Runge and other staff members from Victim Witness Services Coconino County. CCC&Y Executive Director Virginia Watahomigie served as the emcee. A total of 79 Children lost their lives in Arizona last year due to maltreatment. “With this ceremony we honor their lives. We also make a commitment as a community to prevent child abuse together,” the Williams Child Abuse Prevention Council reported. To honor their memory, a total of 79 pinwheels were placed at the park by volunteers from the Williams CAP council. “What our research showed, and what our experiences since then have borne out, is that people respond to the pinwheel. By its very nature, the pinwheel connotes whimsy and childlike notions. In essence, it has come to serve as the physical embodiment, or reminder, of the great childhoods we want for all children,” the organization reported.